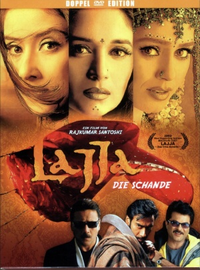 If Rajkumar Santoshi's Damini depicted the saga of one wronged woman, Lajja boasts of four. The hype surrounding Rajkumar Santoshi's Lajja spoilt the magic of going to the movies for me. A brutal look at the injustice and oppression faced by the Indian woman in this day and age forms the crux of RajKumar Santoshi’s Lajja.